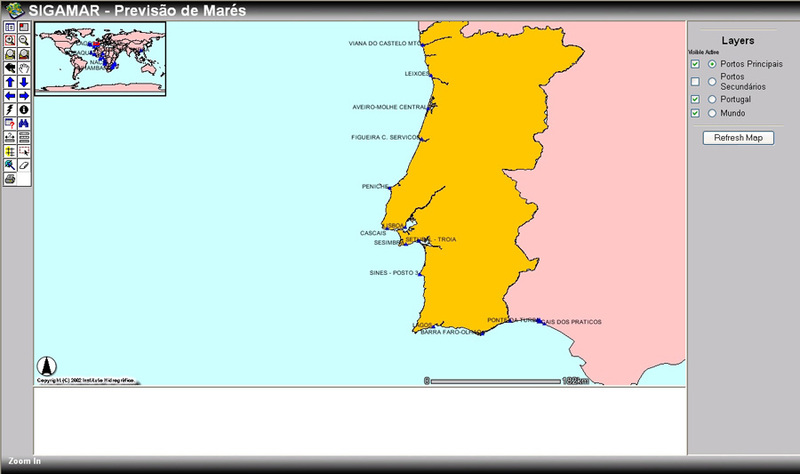 Cartographic coverage of the Portuguese nautical chart folio. 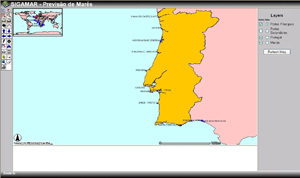 The Portuguese Hydrographic Office (IHPT) is the national authority responsible for publishing official nautical charts. Besides this main task, IHPT also conducts studies, projects, and research in hydrography, physical oceanography, chemical oceanography, marine geology, and maritime navigation. These activities crucially depend on the gathering of a fair amount of field data, and IHPT has been collecting it in a consistent way for more than a century. To store, manage, integrate, and explore all of this data, IHPT created a data center in 1997 and started developing a computer-based information system. The system was to be implemented following a top-down approach. The strategic goals were to improve the internal production processes and support operational, planning, and strategic decision making. The systemcalled SIGAMARis a GIS for the marine environment. It integrates environmental and cartographic data. Its core is an Oracle Spatial database management system that is explored in several ways producing tables, charts, Web pages, and reports and feeding several GIS packages. Although not fully developed, the system is presently at a mature stage with several relevant products already at their exploration phase. The system architecture, developed at the data center, is based on the concept of a centralized database system and decentralized data management. Each technical department is responsible for the input and maintenance of its data, while the data center is responsible for system development and administration. The data center is a technology-based organization, rather than a process-based one, with one system administrator (who is also the database administrator), one GIS manager/developer, two database developers, one application developer, and one Internet developer. The system currently relies on a departmental server computer with four Xeon 500 MHz processors, 2 GB of RAM, two mirror 30 GB system hard disks, two RAID5 64 GB hard disks, and 100 Mbps network infrastructure. Continental platform bottom samples with catalog and seafloor classification. At first, spatial data exploration was to be performed by internally developed applications. Although this was an inexpensive way to kick off the project, it was soon realized that the solution would be very expensive in terms of missed opportunities and time spent on endless application maintenance tasks. The number of estimated end user applications was high, and the end users' universe (about 100) was too large for individual customization. The solution to this problem came with off-the-shelf Esri software. Esri representatives at LisbonEsri Portugalinitially provided ArcView 3.x and extensions. A set of pilot projects was developed to assure end user satisfaction and a new agreement led to the implementation of ArcGIS, ArcSDE, and ArcIMS in the development environment. ArcSDE (for Oracle8i) implementation was made with the prerequisite that it would not change the existing spatial database structure (it would have to work on a read-only basis). This was necessary since SIGAMAR relies on Oracle forms for fully customized data input by non-GIS expert personnel. Soon after this, ArcIMS was producing Web pages that showed the database geographic data on top of a map. This major functionality was available to every Intranet user, and quality control of data improved overnight. Data cataloging, search, and retrieval were made easy with a very flexible interface. As soon as some end users started demanding more GIS power, they were introduced to ArcView 3.x (with the database access extension loaded to read SIGAMAR data via ArcSDE). Scientists and technicians at IHPT have been introduced to ArcGIS capabilities, and some are already using it for their data spatial analysis. ArcExplorer has also been an option for some users. The final result is a very scalable end user set of applications depending on the particular user's skills. Most SIGAMAR users are comfortable with simple interfaces and functionality provided by ArcIMS (in a Web browser) and ArcExplorer. Some database operators and scientists feel the need for ArcView 3.x/ArcGIS analysis functionality. IHPT is now able to have all authorized personnel access SIGAMAR data in a very functional and easy way. The available system products, at this time, focus on internal hydrographic, cartographic, safety of navigation, chemical oceanography, and physical oceanography processes. Short-term development will include marine geology and will extend the already developed physical oceanography processes. 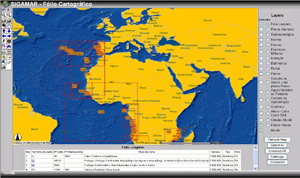 Applications are available and fully functional to visualize and manage topographic control points, cartographic coverage, sea state, tide prediction, tide observation, aids to navigation, and foreign research cruise control applications. Some of these are essential components of the production line of IHPT and constitute valuable resources for decision making. 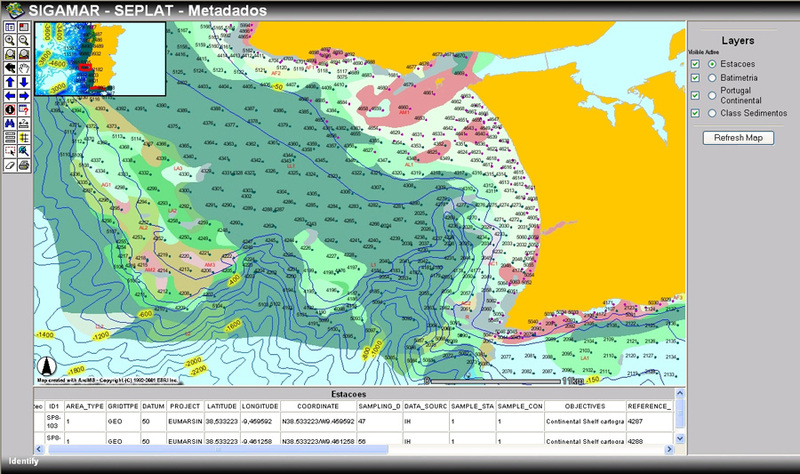 Hydrographic data (soundings) are being loaded and managed by an internally developed application (Hydrographic Data Warehouse). Some of these areas are in the process of massive data input to the database, a slow but ongoing task. Some processes have been designed to automate data acquisition. For example, a set of moored wave buoys measures the sea state of offshore Portugal and sends its readings every three hours to the nearest Portuguese Navy facility (usually a lighthouse) that relays them via modem to IHPT. An application then directs this data to the database and updates sea state information on Intranet and Internet servers. As mentioned, the system has been designed to be explored both internally and externally. Because of security reasons, the internal computer network is physically separated from any external network. 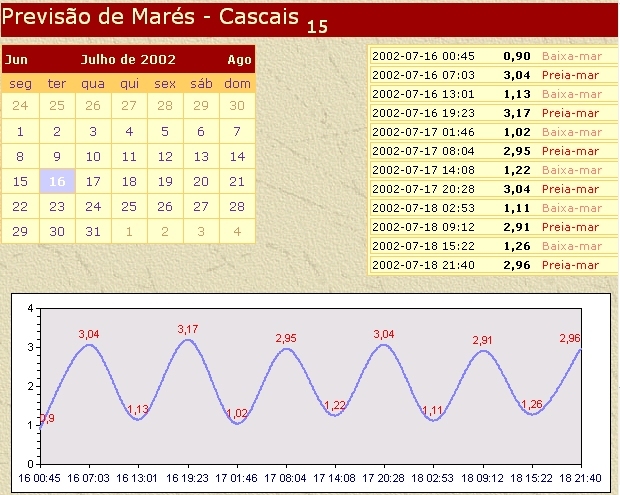 To keep system coherency, a replica of a subset of the database is published in the Internet-enabled network and feeds Internet users with tide predictions and sea state data as these become available. Budget issues and data policy limit the external exploration of the system, but it is expected that a complete Internet catalog of IHPT data holdings will be available to the public in the near future. 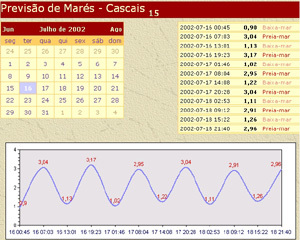 Hotlinked information for tide prediction. In summary, a strong development of database infrastructures and an Esri software-based GIS framework for data exploration and decision making have characterized the last few years of marine data management at IHPT. The level of user acceptance of the new technologies varies, but it has been steadily increasing as the "GIS way of thinking" is proving to be a much more efficient way of dealing with the large volume of data, in both the technical as well as scientific levels of activities at IHPT. Perhaps the most thrilling aspect of SIGAMAR operational exploitation is that it has just begun. In fact, new ideas on how to improve and build new and better knowledge on top of SIGAMAR data are being put forward on almost a daily basis, thanks to user exposure to GIS. For more information, contact Rog�rio Chumbinho or Miguel Bessa Pacheco, Instituto Hidrogr�ficoIHPT (tel. : 351-210-943-130, e-mail: centrodados@hidrografico.pt, Web: www.hidrografico.pt).